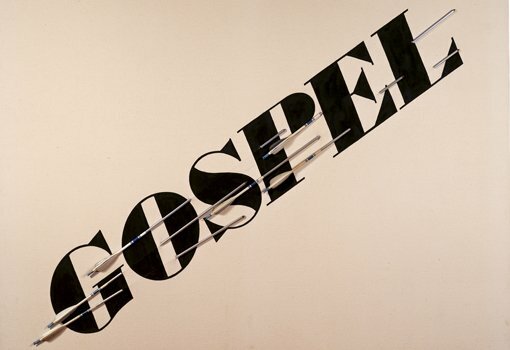 Michael Brand, director of the Art Gallery of New South Wales, today unveiled Gospel 1972, a significant new acquisition for the Gallery by internationally acclaimed American artist Ed Ruscha. Until now, the painting has remained in the artist’s personal collection. This major addition to the Gallery’s collection was made possible by the Art Gallery Society of NSW through its Collection Circle acquisition program. Earlier this year the Society invited Michael Brand to choose an artwork to celebrate his appointment as director of the Gallery. 'I was highly honoured that the Art Gallery Society made this very generous gesture and when asked to choose a work, I immediately started thinking of Ed Ruscha. I have always been drawn to his crisp early Pop paintings and I was also keen to find a work that would support my goal of building stronger ties to art practice in California. I was fortunate to get to know Ed when I worked in Los Angeles and consider him an artist with great public spirit as well as being one of the true giants of our era,’ said Michael Brand. John Masters, president of the Art Gallery Society, said, 'The Society was thrilled to be able to acquire the work by a major exponent of American Pop art for the Gallery’s collection. This work will now be part of the Gallery’s Pop to Popism blockbuster next year. It’s a wonderful work to also acknowledge Michael Brand’s appointment as our director’. 'The painting will greatly enhance the Gallery’s existing collection of international contemporary art. There is only one painting by Ruscha in Australia, from a later period. Gospel is from the key early period and there is nothing like it in Australia,’ said Michael Brand. 'Ed Ruscha and his wife, Danna, have generously assisted the purchase – making a matching contribution, together with the support of the Gagosian Gallery New York – to ensure that we could have this painting in the Gallery’s collection,’ said Michael Brand. With Gospel , Ruscha moved beyond mainstream Pop. Choosing a bold, sweeping typographic style for this culturally loaded subject that is more suggestive of commercial sign-writing than holy scripture, he teases at its gravitas then, literally, pierces it, and the raw canvas on which it is painted, with metal arrows. This simple but powerful physical element introduces the act of martyrdom to the reading of the composition. Moving between two and three dimensions, Ruscha’s Gospel holds the sublime and the banal in perfect tension, making overt reference to the divine text while evoking the everyday reality of popular devotion.